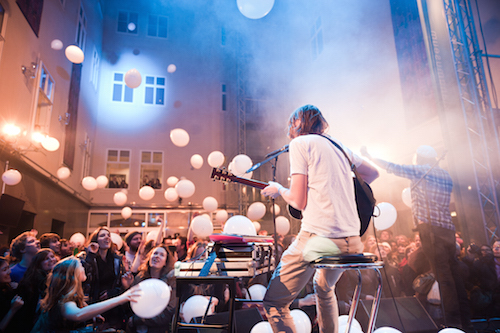 The Live on Stage concert series is organized in collaboration with the Vienna Songwriting Association, and offers a tempting selection of well-known artists and insider information about the alternative music scene. It takes place in the Haus der Musik’s concert hall, which is primarily characterized by its informal setting, where artists are literally close enough to touch. Numerous national and international acts from the singer-songwriter scene have previously performed at the concert series. The Irish folk singer, Glen Hansard, and the heavy metal cover group, Hellsongs, from Sweden have thrilled audiences, as have the alternative psychedelic band, Diagrams, and the neo-hippies, Haight-Ashbury, from the UK. You can find the Live On Stage concerts here – Events. Haus der Musik also presents the festival HDM SINNESRAUSCHEN in its glass-covered inner courtyard, which is transformed into an impressive festival venue for the evening. On a large stage in the inner courtyard, selected alternative indie acts show what the current music scene has to offer.